Crowns are often know as “caps”. They are a tooth shaped covering that goes over a tooth all the way to the gums. 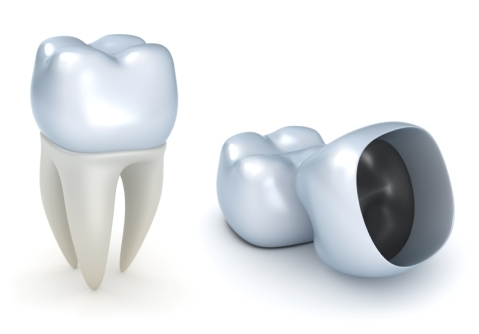 Once the tooth has been prepared for a crown restoration, the dentist will take an impression or mold of the tooth. The impression is sent to the lab where crown is fabricated and then returned to be cemented by the dentist. Crowns are indicated for teeth that have had root canal therapy, have fractures, or have had large fillings placed. Different types of crowns can be placed from gold to porcelain depending on the situation.